Helen studied English and History as an undergraduate and went on to teach in the UK and in the Himalayas for several years before settling in the Scottish Borders where her career as an artist began. For the past twenty years she has been painting and exhibiting in the UK and abroad. She was awarded The Lily MacDougal prize in 2011 and The Gullane Gallery prize in 2013 at the Royal Scottish Academy annual show of The Exhibiting Societies. 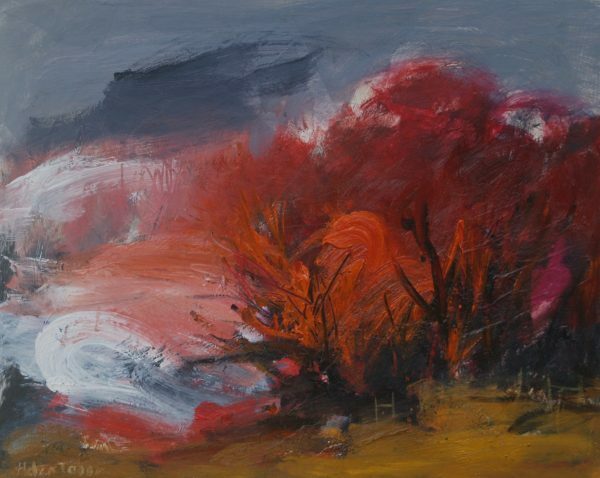 In her landscapes and seascapes, Helen is inspired predominantly by colour and atmosphere. The seascapes can be moody with threatening skies but there is always a stillness about them suggesting the moment before or after a storm or that feeling of melancholy coming form the wind blowing through marram grass. This artist currently has no works for sale, please let us know if you would like to be kept informed when their work is back in the gallery. I love visiting The Green Gallery. This family run business always has something interesting on display. One can visit without buying and feel welcome every time.